When arriving at the ward, ANWAR SURYADI and his son Ali were busy packing up, and expecting their journey back home. Although ANWAR SURYADI was 70 years old, he specially changed his clothes for this interview. He was so optimistic and energetic that looked nothing like an acute leukemia patient. When talking about his illness, ANWAR SURYADI said that he was lucky. He did not suffer from other symptoms like fever, bleeding, etc, except for generalized weakness. Long term weakness made him realize that there was something wrong with his body. After go to hospital for examination, he was told that his leucocytes were at a very low level. Further examination showed that he had acute leukemia. Sporty as ANWAR SURYADI, he never thought that he would get leukemia. Although ANWAR SURYADI knew nothing about leukemia, the worry from his family made him deeply realize the seriousness of his condition. Therefore, he decided to look for better doctors and treatments. Learning that ANWAR SURYADI had leukemia, his friends highly recommended Modern Cancer Hospital Guangzhou to him, because they used to receive treatments in Modern Cancer Hospital Guangzhou and got a good efficacy. Moreover, ANWAR SURYADI read many positive reports about Modern Cancer Hospital Guangzhou on the newspaper before. ANWAR SURYADI felt good about Modern Cancer Hospital Guangzhou because of friends’ strong recommendation and newspaper’s reports. He decided to take cancer treatment in China instead of hospitals in Indonesia. After hospitalization, ANWAR SURYADI was first arranged to take a series of examinations. According to the medical report, doctors from Modern Cancer Hospital Guangzhou explained his condition to him in detail, and specially made him a therapeutic plan. ANWAR SURYADI thought that, for patients, time is life. He was satisfied with the high working efficiency of Modern Cancer Hospital Guangzhou. 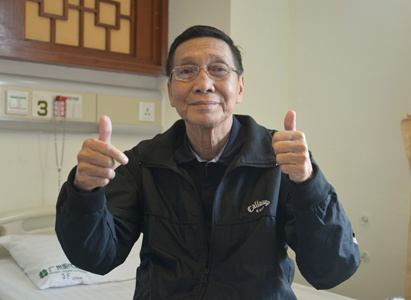 He also gave full trust to Modern Cancer Hospital Guangzhou, he always followed the doctor’s advice, he said: “I never ask about the treatment, because I trust the doctors. I just take the treatment patiently. Facts proved that my trust and patience help me get a happy ending.” Although he took 5 sessions of interventional therapy, he didn’t suffer from any symptoms or side effects. He felt relaxed and energetic after taking interventional therapy, compared with his previous states of weakness. 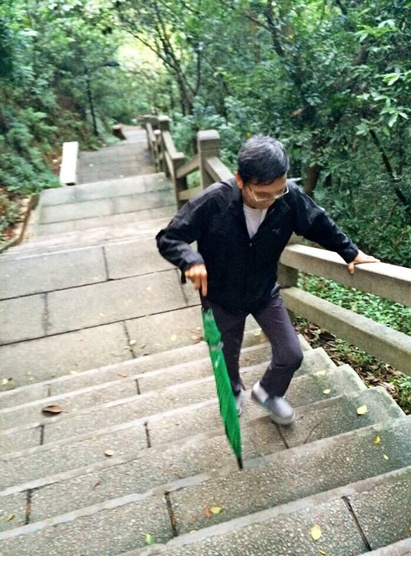 ANWAR SURYADI was climbing the Baiyun Mountain. He also mentioned that he actually had concerns before he decided to take treatment in Modern Cancer Hospital Guangzhou; he worried about the language barrier. However, the considerate services from the interpreters comforted him. He thought that doctors and nurses here are friendly, and the medical technologies are advanced. Actually, ANWAR SURYADI did not just take treatments in Modern Cancer Hospital Guangzhou. During hospitalization, he had a good time with his son. They climbed the Baiyun Mountain, hung out to Beijing Road, traveled Zhujiang Newtown and other famous scenes. His son Ali also established a good relationship with the patients, doctors and nurses in the hospital. ANWAR SURYADI indicated that he felt comfortable at Modern Cancer Hospital Guangzhou. 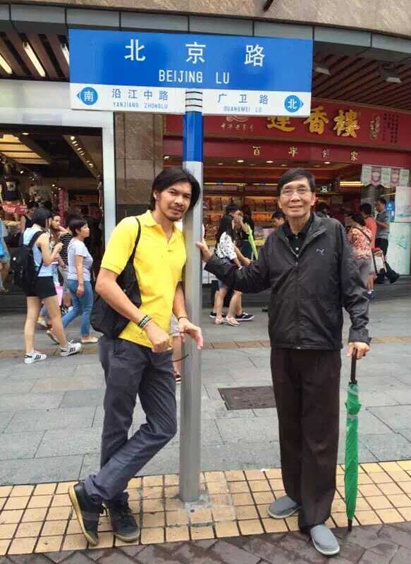 ANWAR SURYADI and his son hung out to Beijing Road. During the interview, ANWAR SURYADI was in a good mood because he was going back home in the afternoon. He mentioned that his families and friends were waiting for him. He would enjoyed his life after went back home. He may also travel around China if he has the chance. Meanwhile, he said to other patients: “If you are suffered from cancer unfortunately, it is a good choice for you to take treatments in Modern Cancer Hospital Guangzhou. Wish everyone a healthy body.” Here, we wished ANWAR SURYADI peace and health.